This article is a wrap up on the Mi-Go and will discuss the impressions these entities have had on human culture and their prehistoric war with the Elder Ones. This subject was not covered as part of the original talk I gave at the Necronomicon in Providence, RI back in August 2013, however, I thought such discussions were necessary. 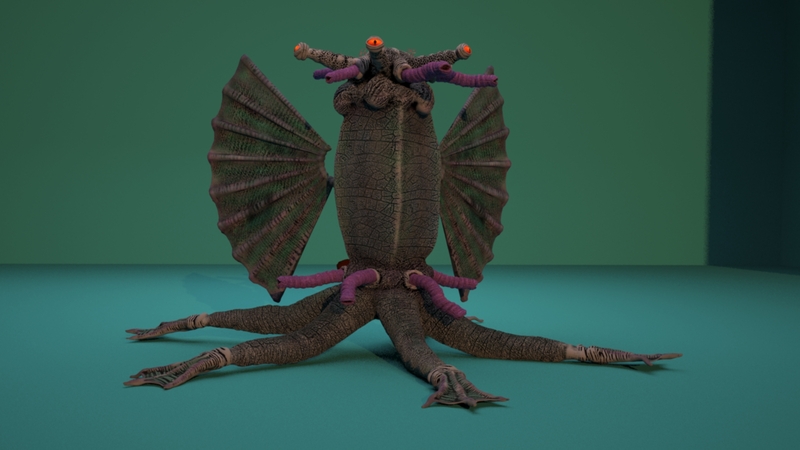 Unlike the Elder Ones, which were largely unknown by humanity until the Pabodie – Lake expedition to Antarctica in 1930-31, the Mi-Go have interacted with humanity over the centuries. Encounters between humanity and the Mi-go have been extremely rare but are known to have occurred. In turn, these encounters have permeated human culture, folklore and legends. I will identify a few of these in this article. The first example, which was described by HPL, was the legend of the yeti or abominable Snow Men of the Himalayas. 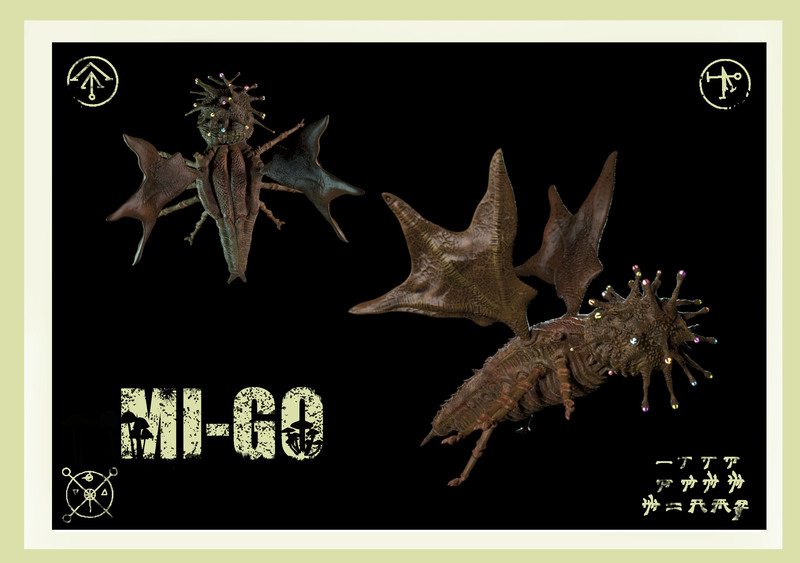 Several times in At the Mountains of Madness, HPL identified that sightings of these creatures were actually Mi-Go. In fact, it is hypothesized that most of the sightings of large hominids (e.g. bigfoot, sasquatch) through the world, particularly in higher elevations, are attributed to the Mi-Go, donning furs or pelts of large mammals. The Mi-Go disguising themselves as large, hairy hominids makes sense. First, misdirecting human mythology away from crustacean-like fungoid creatures toward large ape-like creatures is an effective means of removing concern or interest in the Mi-Go. 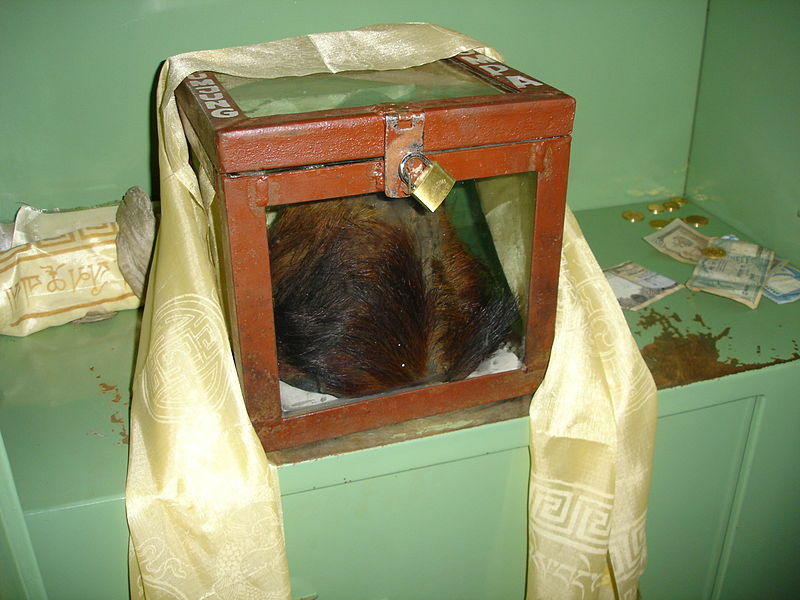 Second, it would explain the scalps and other mummified artifacts (e.g. hands) that are found in the Himalayas. Some consider these as holy / religious artifacts (see below). Yet, it is interesting how the yeti scalps and mummified hands remind one of the waxen face and hands of Akeley’s found in that lone farmhouse in Vermont at the end of The Whisperer in Darkness. In addition, while this connection between the Mi-Go and sightings of the abominable Snow Men was not explicitly described in The Whisperer in Darkness, it should be noted that the brain in the Mi-Go cylinder that spoke to Wilmarth said it encountered the Mi-Go in the Himalayas. No doubt the Mi-Go would disguise themselves as large hominids in the mountains throughout the northern hemisphere and would occasionally make contact with a select few individuals. Besides disguising themselves as large hominids, the Mi-Go also pose as other creatures. More than likely sightings of the Mothman were actually of the Mi-Go as well. The Mothman is the name giving to a creature that was observed in West Virginia; these sightings started in the late 1960’s. 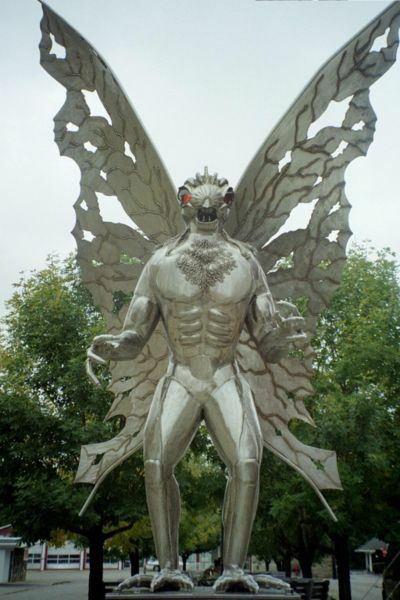 The Mothman was reported as being a man-like figure with huge wings and large, glowing red eyes. Again, it makes sense for the Mi-Go to disguise themselves when flying at night in case someone caught sight of them. Indeed, some sightings of UFOs may also be attributed to the Mi-Go. To conclude this discussion on the Mi-Go a few comments will be made on the war between them and the Elder Ones. As previously discussed, the Elder Ones and spawn of Cthulhu battled on ancient Earth, which eventually ended in peace. The Elder Ones took to the sea while the Cthulhu spawn took to the newer lands. However, later the new lands of the Pacific suddenly sank into the sea, taking the great stone city of R’lyeh and the Cthulhu spawn with them. The Elder Ones were once again the supreme entities of the Earth and won this war by default. In contrast, when the Mi-Go came to Earth, it sounds like the Elder Ones did not do so well. This was after a great civil war with the Shoggoths (called the subjugation) and the Mi-Go, similar to the Cthulhu spawn, were made of different matter than the Elder Ones. The net result seemed to be that the Mi-Go got the upper hand with the Elder Ones. The Elder Ones lost some of their abilities over the centuries, including the power to travel through interstellar space, and were driven back into the sea and the southern hemisphere. The Mi-Go remained in the northern hemisphere, mining for precious metals and studying humans even to this day. Thus, while the Elder Ones civilization declined over the centuries, the Mi-Go remained active on Earth as well as throughout the solar system.